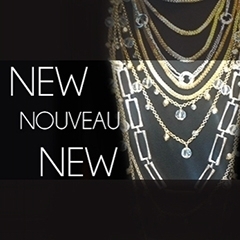 Necklaces and pendants transform the way you look. Whether our mood is for classic, trendy or glamourous, express yourself and do so eloquently with our new genuine 18K gold and rhodium plated pendants and necklaces . Always $10. Only at GOLDFOR10. 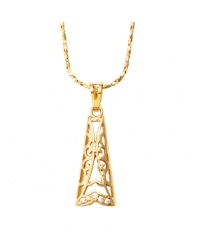 This elongated pendant plated in 18K gold is delicately crafted and offers the regal look of solid gold. Plus, like all our pendants, it comes with its matching necklace. 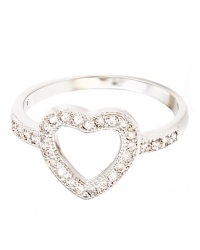 This pendant stunning with its shinning crystals and its 18K gold plated base, it will charm its way into your heart. Finely designed, this pendant and necklace set in the shape of a diamond teardrop, is entirely rhodium plated and features exquisite cubic zirconia stones. 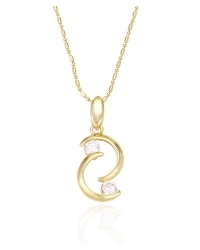 This 14K gold plated pendant features the sparkle of 2 simulated diamonds thereby creating a delicate and feminine piece. 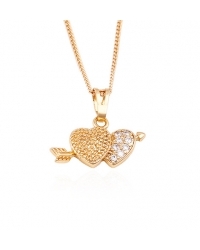 This gorgeous 18K gold plated heart and arrow necklace combines adorable with fierce. 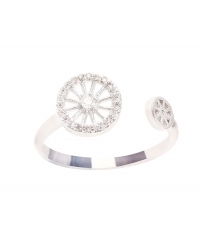 The sparkle of the simulated diamonds adds the right touch of glamour. 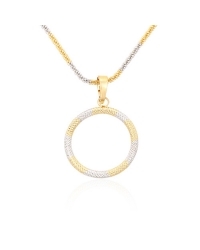 This classic circle pendant and necklace is plated in genuine 18K gold. 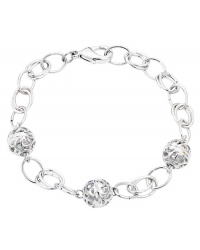 A perfect piece of jewelry for any occasion. This beautiful apple pendant and necklace set is plated in 18K gold and is exquisitely designed. You'll want every day to be apple picking day ! 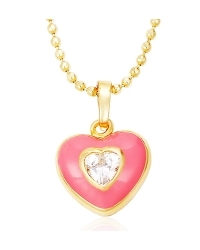 This lovely heart pendant and necklace is plated in 18K gold and features the brightness of a colored enamel finish. 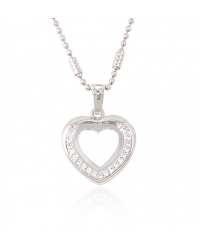 Trendy and romantic meet in this sparkling simulated diamond heart shaped pendant and necklace set. 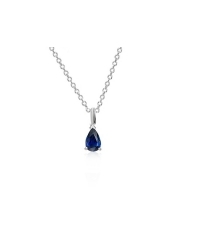 This simulated sapphire pendant is the ultimate in classic and features a simulated sapphire of approximately 1 carat. Around your neck it will look like a million bucks. This absolutely gorgeous hamsa pendant and necklace set plated in 18K gold is exquisitely designed. Hamsa charms are typically believed to protect us against the evil eye and negative energies. 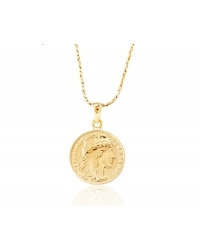 This one-of-a-kind 18K gold plated coin pendant and necklace is anything but boring. 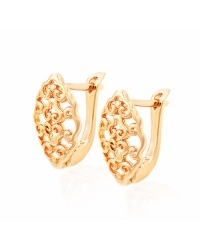 This will add the instant golden oomph to any look.